One of the darlings of the tea world, matcha is a stone-ground green tea and a traditional staple in Japan. Now it's making a splash in the United States, with coffee shops and juice bars around the nation not only carrying it, but singing its praises. It's marketed for weight loss and other health benefits, but it's too early to know whether it unequivocally enhances weight loss. The bulk of the available data is based on research on mice, which may not translate to humans. Still, matcha is a unique, antioxidant-rich and health-promoting beverage you may want to incorporate into your weight loss plan. So the matcha beverage you pick up at your local coffee shop contains 100 percent of the tea leaf, which is unlike regular green tea, in which the leaves are steeped in water and the nutrients come from what leaches out into the liquid. Because you're consuming the leaf in whole form when you drink matcha, you're getting a more concentrated source of nutrients from the plant and perhaps additional nutrients that aren't water-soluble. The major antioxidant in green tea -- EGCG -- is linked to potential weight loss benefits, and matcha has more of it than regular green tea. 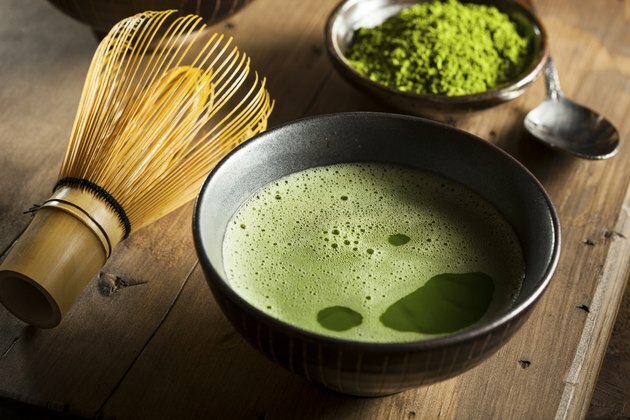 The EGCG concentration from drinking matcha is three times higher than that of regular green tea, according to an analysis the "Journal of Chromatography" reported in September 2003. The EGCG in matcha may boost your metabolism during moderate-intensity exercise, thus enhancing weight loss, suggests a small study. On average, green tea extract increased study participants' fat-burning capabilities by 17 percent when they engaged in cycling exercise for 30 minutes. This study only had 12 subjects, so more studies are needed using a larger sample size and actual brewed tea instead of the extract. The good news is that the amount of EGCG used in the study may be found in a cup or two of matcha tea, based on studies published in the American Journal of Clinical Nutrition in March 2008. The rich polyphenol compounds found in matcha and other plant foods in your diet help lower the risk of chronic diseases, such as diabetes, osteoporosis and cancer; they also help keep your brain healthy as you age. And, plant polyphenols are often cited for their role in heart health; they fight against hardening of the arteries, known medically as "atherosclerosis," according to a review published in the Oxidative Medicine and Cullular Longevity journal in November 2009. Atherosclerosis causes arteries to narrow and become clogged, which may cause heart attack or stroke. Other ways polyphenols may protect your heart is by increasing good cholesterol, reducing inflammation, and improving circulation in your arteries by preventing your blood from clotting. Take advantage of the health benefits of matcha by replacing your morning cup of Joe with this health-promoting tea. To incorporate it into your weight loss plan, drink matcha tea between meals. Sipping tea with your snacks may help keep your appetite in check while you follow a reduced-calorie diet. EGCG stimulates hormones that help you feel full, according to an experiment the Journal of Clinical Biochemistry and Nutrition published in September 2015. To boost your fat-burning capacity during workouts, have a cup of matcha 30 minutes before working out. For optimal weight loss, it's imperative to combine a nutritious reduced-calorie diet with regular exercise.